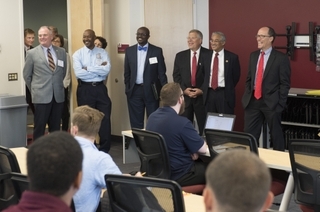 NEWPORT NEWS, Va., Sept. 21, 2015 (GLOBE NEWSWIRE) -- Huntington Ingalls Industries (NYSE:HII) hosted Secretary of Labor Thomas E. Perez and Rep. Bobby Scott, D-Va., today for a tour of The Apprentice School at the company's Newport News Shipbuilding division. Newport News President Matt Mulherin, Newport News Vice President of Trades Operations Ray Bagley and other executives led the tour, during which Perez and Scott interacted with teachers and apprentices in a pre-calculus class. They also met with company leadership to discuss the state of the workforce at Newport News and the school's partnership with local community colleges as an education and training engine in Hampton Roads. Perez talked with second-year students about what they like best about The Apprentice School. When he asked which students had prior college experience and college debt, the majority of the class raised their hands. "That's the beauty of this," Perez said of the school's tuition-free education. "You stack one skill on top of another on top of another, and all the while you're doing it without accumulating debt. You're in a great program that's going to set you up for life." As the 26th Secretary of Labor, Perez is working to connect ready-to-work Americans with ready-to-be-filled jobs, through registered apprenticeship and on-the-job training programs like The Apprentice School. Prior to his current role, Perez served as assistant attorney general for civil rights at the U.S. Department of Justice and as secretary of Maryland's Department of Labor, Licensing and Regulation. "It takes highly skilled shipbuilders to build the Navy's fleet of aircraft carriers and submarines," Scott said, "so it is critical that we have the necessary training, education and workforce development infrastructure in place. Thankfully in Hampton Roads, we have the private and public sectors working together to support our shipbuilding workforce. The secretary and I have collaborated on a number of training and education issues, and I was happy to host him in Newport News today." Scott is the ranking member on the Committee on Education and the Workforce, a committee he has served on since his arrival to Congress in 1993. The committee oversees education and workforce programs and has jurisdiction over a wide range of legislation, including the Workforce Investment Act, the Elementary and Secondary Education Act, the Higher Education Act, and the Fair Labor Standards Act. 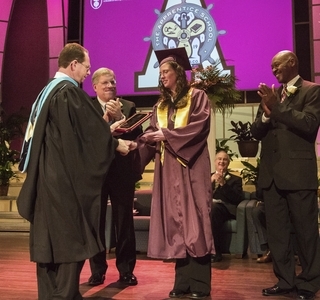 The Apprentice School offers four-to eight-year, tuition-free apprenticeships in 19 trades and eight optional advanced programs. Apprentices work a regular 40-hour week and are paid for all work, including time spent in academic classes. 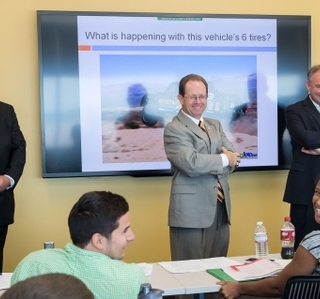 Through partnerships with Old Dominion University, Thomas Nelson Community College and Tidewater Community College, the school's academic program provides the opportunity to earn associate's degrees in business administration, engineering and engineering technology and bachelor's degrees in mechanical or electrical engineering.